As a birth doula and prenatal yoga instructor, I am fortunate enough to witness the inspiring transformations that take place during the journey of conceiving a child, being pregnant, giving birth, and nurturing a newborn. It is a raw and beautiful human experience, with its fair share of surprises, challenges, and moments of sheer bliss. During this time, the body is going through numerous physical, mental, and emotional changes, all of which are a normal part of the journey. Many say that the changes that transpire during gestation help to prepare mothers for the major shifts that come with having an infant. As a doula, I like to combine a few tricks, along with helpful health education, and yoga techniques, to assist expecting and new parents with weathering the challenges that may come about during pregnancy and beyond. I like to combine these practices with coaching my clients on how to best adopt an attitude of patience, surrender, and acceptance as they witness their bodies, minds, and souls transform. 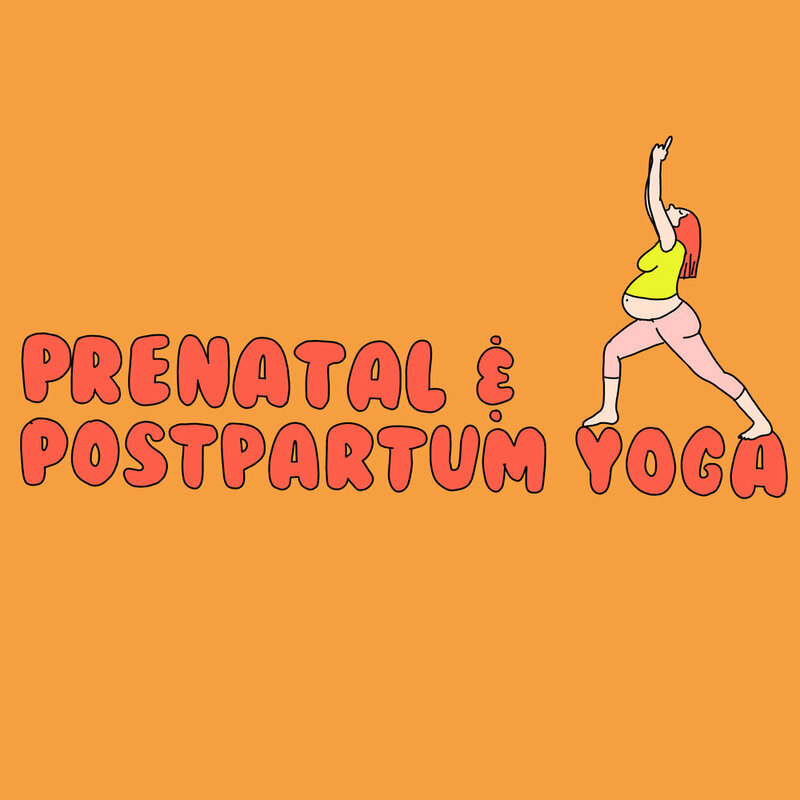 In this essay, I’ll share with you some of the ideas, considerations and physical movements when practicing yoga during pregnancy and after childbirth...And you’ll learn some great poses you can safely try on your own! A quick note: As with any exercise, if you are pregnant, it is important to check with your healthcare provider first, especially if you’ve experienced any complications. Always LISTEN to your body and do what feels best for YOU. While yoga is an excellent way to bring mind, body, and breath together for a moving meditation, there are certain poses to avoid, and certain poses you want to practice more frequently when pregnant. Generally speaking, you want to AVOID forward folds, twists (especially those from your abdomen), or laying on your back for long periods of time. Conversely, you want to focus more on poses that open your hips, tilt the pelvis back and forth, and create space in the abdomen and pelvic region. During pregnancy, the body produces high amounts of the hormone relaxin during the first trimester and right before delivery. Relaxin is important to know about because it has a number effects that impact pregnancy. First, it does just what it sounds like...it relaxes ligaments, joints, tendons and muscle fibers. This is great news for the pelvis and cervix as relaxation is needed to accommodate a baby moving through the birth canal. As a result, Relaxin can also contribute to feeling wobbly and more flexible than ever during your pregnancy, so be extra aware of changes in balance and hyperextending the joints and ligaments. Relaxin stays in the body up to five months after birth, and even longer if breastfeeding, so if you find yourself feeling some of these sensations past pregnancy, know that it’s normal, and be gentle with yourself. Another amazing fact: For pregnant people, the volume of blood can increase anywhere from 30-50%! This means there are about one and a half liters of additional blood circulating through the body, bringing nutrients to the growing fetus. Relaxin has a role here again, helping the body to accommodate the higher volume by relaxing the blood vessels, and maintaining a healthy blood pressure. A common condition to be aware of as your pelvic girdle gains more space and mobility, is pressure on the sciatic nerve, which can cause piercing pain sensations and lower back issues at any stage in pregnancy. Add the pressure of the baby, and it can be quite uncomfortable to say the least. To relieve this type of lower back pain, it is best to stretch the piriformis muscle, a muscle deep in the buttocks. Here is a pose that brings relief and is easy to get into no matter how big your baby bump is! This is a great way to open the hips and relieve sciatic nerve pain, and you don’t have to get on the floor, which can be a feat in itself toward the end of pregnancy! Think of this energetically as a way to create more space for you and make the baby feel comfortable. Stand within reaching distance of the chair or wall, so you can safely balance. Start with your feet hip-distance apart. Keep your chest upright and gaze forward, sending your rear end back as you bend into the knees. Knees should not bend any deeper than a 90 degree angle. Hold onto whatever lucky thing you need for balance. Shift your weight into your left foot, and bring your right ankle to cross on top of your left thigh, just above your knee. Keep your right foot active by flexing the toes back, so your ankle is also at a 90 degree angle. Keep the right hand on the thing for balance, and push your left hand into the bottom of your right foot. Continue to flex the toes back and keep the right ankle active. This will help stretch the piriformis, glutes, relieving pressure from the SI joint. Pause and breathe, sending your hips back in space and your right knee down in the direction of the floor. Press into the bottom of the right foot as much as you need to feel that relief. Take 5 deep, long breaths, feeling relief as you deepen the stretch with the exhale. Imagine any other tension in the body melting away with the exhale, and breathe in a sense of strength and acceptance to carry you through this special time in your life. Slowly and carefully release your right foot down and relax out of it or dance in place. Repeat on the other side. You may only feel sciatic nerve pain on one side, but it is important to even out the stretch in both hips. If standing and balancing is too strenuous, find a seat in a chair (preferably without arms) and do the same thing- crossing one ankle over the thigh, and pressing the knee towards the floor. As the baby grows, internal organs can also become more and more compressed. Yes, the belly is getting bigger, but your organs aren’t going anywhere! This causes issues like heartburn when the baby presses into your stomach, or feeling like you have to pee all the time when the baby puts pressure on your bladder. A prenatal yoga practice can help relieve some of this pressure, again, creating more space in the body for the growing baby. At week 16, the breasts begin to produce colostrum, the precursor to breast milk. Heavy boobies and a heavy belly can add a ton of extra weight, pulling on the front of the body. This may cause general back pain and achiness from working hard to maintain an upright posture. Many women find relief on hands and knees, simply because the weight of the belly and pressure of the baby are off the sacral nerves, and the muscles along the spine and back are not straining to maintain posture. One of my go-to poses for relieving pressure and managing general back pain at any stage of pregnancy, is cat-cow breathing. A pelvic tilt can bring immediate relief to your back, and is thought to have a positive effect on ensuring the baby’s head stays down toward the pelvis for delivery. You can find more details on this pose in my Period Yoga Essay! Hip-openers are essential for prenatal yoga. Building awareness in the hips and pelvis increases your body’s ability to get into favorable positions for childbirth. From the all-four position of cat-cow, you can go right into an excellent prenatal hip-opener. This allows the belly to hang forward, relieving pressure from the back and pelvis. It stretches the groin, and leaves you in control of how deep you want to push the hips open. Energetically, you are inviting ease and flow into the body for a healthy birth. Find yourself on all fours on the ground with your hands directly under your shoulders, and knees hip-distance width apart directly under your hips. If your knees are sensitive- add padding with a folded blanket or yoga mat. Take your right foot out to the side on the ground, with the right knee bent, and your toes pointing directly out to the right. Your thigh should form a 90 degree angle away from the torso, and your right foot is in the same line as your left knee, pointing to the right. Step your right foot a little further away from the body, so that your heel is slightly further away than your knee. With your exhale, bend deeper into the right knee as you shift your torso over to the right, keeping your left knee where it is on the ground. Keep your torso facing forward, and the right knee out to the right. Keep your left hand on the ground, supporting you directly underneath your chest. Bring your right hand to your right knee and press the knee back to feel the hip open even more. This is where you will use your judgement and take the stretch as deep as it feels good in your body. Stay here for at least 5 deep breaths (30 seconds). With every inhale you are filling your belly and lungs with energy, relaxing the pelvic floor and the shoulders. With every exhale you are sinking deeper into the right hip. When you feel complete on this side, come back to the center and feel the difference in the hips. Feel free to wiggle the hips side to side if that feels good. You gave birth! You are now in what’s known as the “fourth trimester,” the first 3 months after birth. This is when some of the most joyous, breathtaking, exhausting, and challenging times of the entire process take place. Each person’s experience with a newborn is completely different than the next, so try to keep in mind the same surrender, acceptance, and patience that carried you through your pregnancy. With the hormonal changes and major life transitions during this time, it is important to stay present and grounded. Ask for help if you are experiencing major changes in your mood or physical being, and reach out for support when you need it. Each birth is unique, so it is often difficult to generalize what will feel good in your body post-delivery. Birth injuries such as tearing, bruising, or incisions take time, patience, and lots of rest to heal. Just as your baby is learning how to thrive in a whole new environment, you are learning how to be in a new role, with a new awareness of your body. You have time to recover from birth, so give yourself the permission to pause, heal, and enjoy being with your newborn. Your healthcare provider will let you know when it is safe to practice physical exercise again, yet always listen to your body because you know your body better than anyone else, and there is no rush. While your abdomen and pelvic region are healing and resting, you now have to carry a baby in your arms, breastfeed, or bottle feed-- all of which can strain the muscles in your neck, shoulders, and upper back. Focus on what you can do and what feels good. While you are feeding your baby, use this as a time to check in and see if you are straining your neck, or tensing your back muscles. Sometimes it is hard to release these chronically tense muscles. Try squeezing your shoulders up like you are exaggerating the tension with the inhale, then exhale and completely release, dropping your shoulders down. Be sure you are relaxing your jaw and the muscles in your face. It may even help to look up once in a while, stretching the front of the neck and throat open. This helps draw the shoulders back, stretch the muscles around the chest, and even get into the neck muscles. It is a counter stretch for all the forward-facing-baby-lifting and looking down that happens while caring for an infant. This may add a burst of energy to fight fatigue, and keeps your heart energy open and flowing. - A comfortable place to stand or sit without a seat back or anything blocking the space directly behind you. Bring your hands together behind your low back, and interlace your fingers. Straighten your arms as much as possible while keeping your fingers interlaced, palms facing toward each other, possibly touching. If your elbows do not straighten entirely, that’s ok. Pause here and with your inhale feel the shoulders coming together around the spine, and the chest muscles stretching open. Keeping your hands together, bend your elbows and bring your fists over to rest on the left hip. Pull your left elbow back to expose the front of the left shoulder open more. You should feel the majority of the stretch in the front of the right shoulder. Drop your head to the left, and you will feel the stretch all the way from your right shoulder into the right side of your neck. Wiggle and relax your jaw. Pause as you surrender deeper into the stretch. Now allow your head to gently roll forward and back, in a half-circle over your left shoulder. This will help you stretch the muscles throughout the right side of your neck. If there is one area that needs more time, pause and breathe into it until you feel muscle tension release. Breathe in new life and energy with every inhale. Release stress and emotional tension with every exhale. When you feel complete on the right side, bring the hands through the center to straighten the arms once more behind you to open the shoulders, and then switch sides. Repeat whenever you need a pick-me-up. Ab separation, or diastasis recti, is common in about two-thirds of postpartum mothers. Your healthcare provider can help you diagnose whether or not you are experiencing this issue. If you are healing from ab separation, it is important not to put any outward pressure on your abdominals as they recover, like being on hands and knees, cat-cow breathing, and the downward facing poses that felt oh-so-good during pregnancy. Unfortunately, they will not help recover from ab separation. Talk to your healthcare provider about resources for healing diastasis recti. In the meantime, you may begin the process to reconnect with your core. This is a simple breath that you can try when your baby is sleeping. After being a home to another human, this is a conscious way to relax and connect with yourself and your core again. Find a comfortable seat with your spine nice and straight. You can lean into the back of your chair if necessary, or even do this lying down. Place one hand over your belly and one hand over your heart. Take a deep inhale, expanding your chest, dropping your shoulders back, and feeling your belly fill with air. As you exhale, gently pull your core in, relax your jaw, and make sure you are not tensing any muscles besides your core. This is a very gentle way to bring life back to your abs, so DO NOT tense with all your strength. Repeat for at least 10 breaths in and out. Feel yourself connecting more and more with your body, soul, and life force. It is easy to lose this connection while raising an infant, and even more important that you work to maintain this connection for yourself so you have more to offer your family. Finally, if it is time to begin rebuilding pelvic floor muscles, and you’ve been cleared to do so by your healthcare provider, head to the Pelvic Floor Essay for some techniques to strengthen and rebuild the pelvic floor muscles. Above all, acknowledge your participation in the miracle of transformation that has taken place. You are stronger than you think you are! Give yourself permission to feel and heal at your own pace and listen to what your body is telling you.